In fall 2014 we welcomed the recently renamed ASHA to the yard. 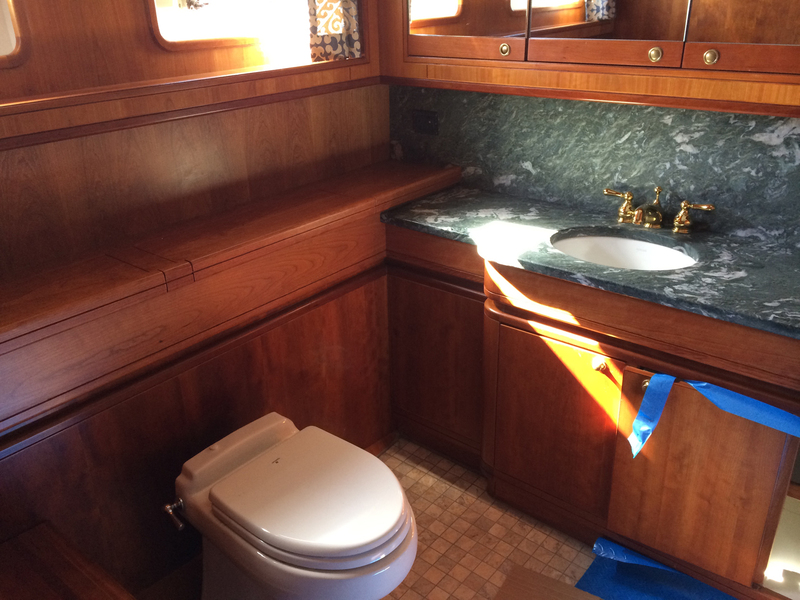 A 90-foot Palmer Johnson motoryacht, her new owner requested a comprehensive refit of the boat. He brought her up to Belfast from southern Florida for the extensive work. 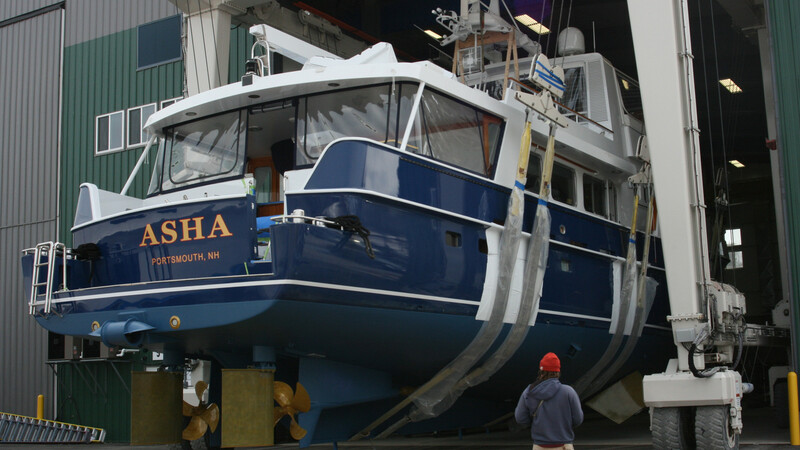 Watch a video about ASHA’s refit. 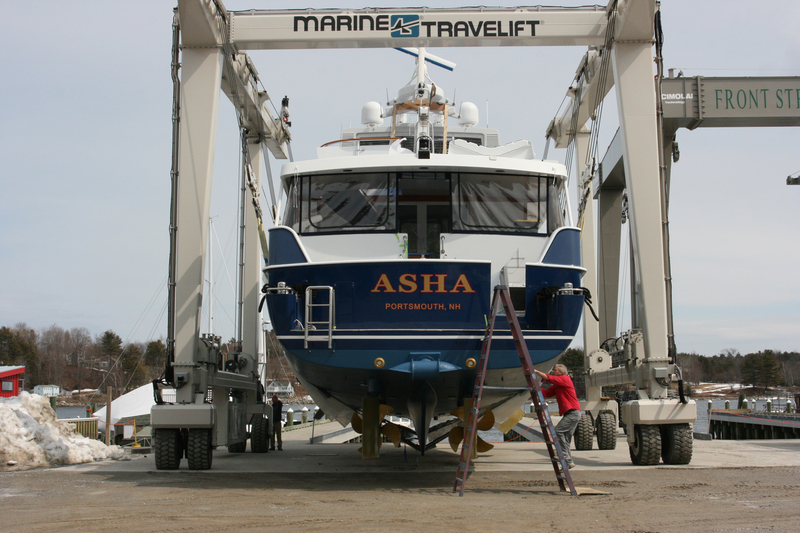 ASHA’s hull had significant corrosion, so we made extensive repairs that included a lot of paint touch-ups. Our coatings team also painted her flybridge and replaced the non-skid. 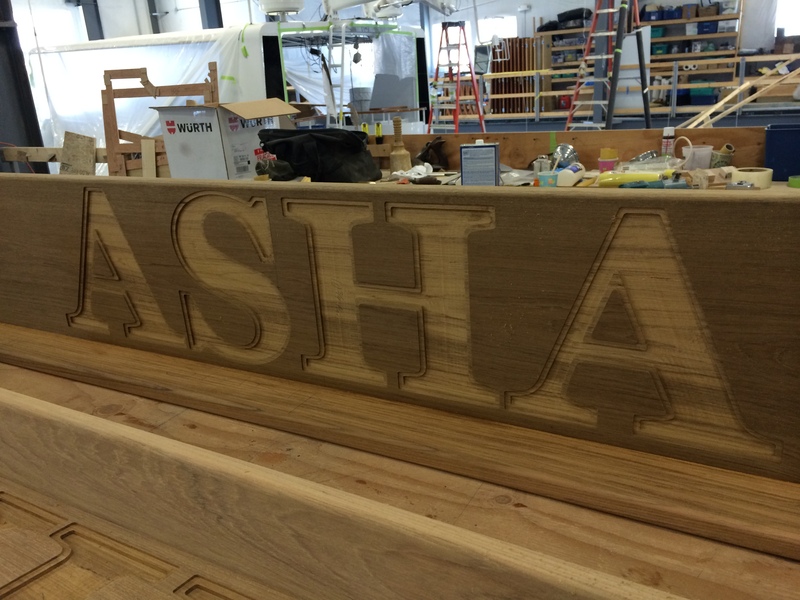 Our carpentry crew spent several months in ASHA’s interior, giving her comprehensive updates. 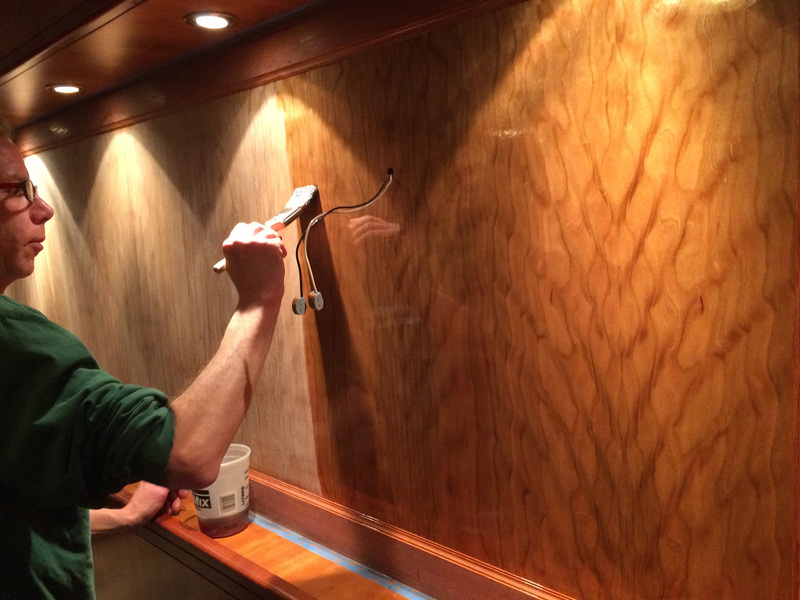 They crafted all new teak and holly soles in the galley, along with a beautiful new set of teak stairs. 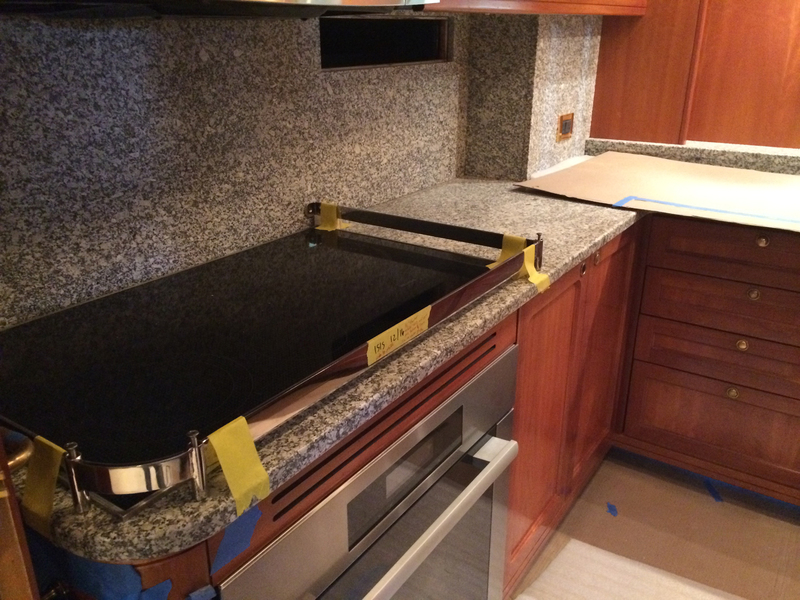 New granite countertops modernized the galley. Additional granite countertops in the master head and stonework in both the showers has refined the aesthetic of the heads as well. For a little added luxury, we installed heated tile floors in the master head. The owner’s cabin has a striking new varnished wood headboard with complimentary countertops that brighten the room and please the eye. ASHA’s systems required some maintenance and updating. Our mechanical team started by installing a new stern thruster to improve the yacht’s agility and performance. The hydraulic system required some updating, so we also replaced almost all of the hydraulic fittings and hoses. In the power system, we refurbished the shaft, flexible coupling, and props. We rebuilt or replaced all major pumps, and we gave all of ASHA’s thru-hull fittings a thorough inspection by removing them and re-bedding them. We also replaced most of her hoses and fittings throughout the entire boat. We installed several new electronics on board the boat. We also installed some new appliances to get her ready for cruising. Finally — and perhaps most importantly! — we built new nameboards for her to display her new name.